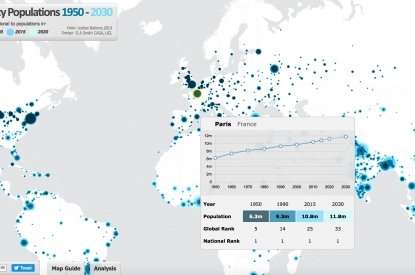 By 2050 there will be 9 billion human beings to feed and no less than 70% will be living in cities, according to the UN. Our way of producing, growing and consuming food will therefore face a great challenge to cope with this demographic explosion. 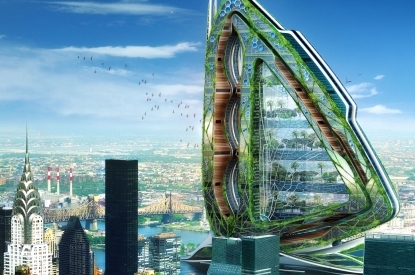 City agriculture may be the solution, according to some sustainability futurologists such as Vincent Callebaut, with architecture designed for vertical farming (the creation of skyscrapers dedicated to farming). Falling between utopia, with the “Dragonfly” project, an “urban farm” which will rise up 700m over Roosevelt Island (New York), and ongoing, “home-made” mini-farm projects (in the image of the OwnFood prototype from the COP21) SIAL offers you a leap into the world of agricultural skyscrapers for aboveground farming of a new order. The figures speak for themselves. By 2050, the demand for food will have doubled due to rampant urbanisation, while 80% of farmable land is already being used. 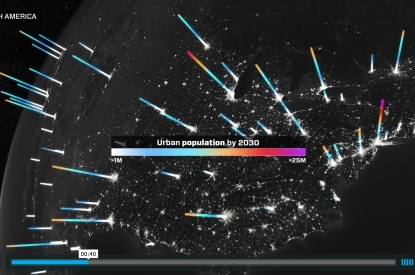 The equation is simple, the question unambiguous: how will tomorrow’s homo urbanus feed himself? The answer seems to come directly from science fiction. Indeed, it is an entirely new way of conceptualising space, thought up by agronomists, architects and designers. It is based on the theory of vertical farming, a concept introduced by Dickson D. Despommier, a microbiologist and Professor of Public and Environmental Health at the Columbia University in New York. Imagine that you are in New York at the southernmost tip of Roosevelt Island in a 700m high building. Orchards, vegetable patches, terraced rice fields, wheat fields, green roofs and grassland for rearing animals spread out in front of you like some kind of mirage. This is 2009. The view reminds us of an endless greenhouse right in the heart of the city. This is the Dragonfly project, by the architect Vincent Callebaut, conceived to embody the future of aboveground farming: hydroponics. In these images, closely linked to those of the pioneers of the U-City, city surface area is facing up to the challenge of urban densification. Dragonfly is taking on the vertical theme of skyscrapers. So, the idea is to produce food in substantial quantities in city skyscrapers. The aim is to reduce the energy-consuming methods by promoting proximity and short circuits. Not far from the concept of “cradle to cradle” (or C2C), the entire production chain would be revised with a focus on recycling to save on, for example, water requirements. From Vincent Callebaut’s fictional prototype to a concrete plan, the installation of these agricultural spaces on urban ground is coming at speed. It includes a genuine mini-ecosystem, largely based on LED lighting. AeroFarms, the biggest aeroponic farm in the world, opened this year in New Jersey – Newart, more precisely. It consists of mile after mile of lettuces and cabbages lit up by a system of LED lights, right in the centre of the city. It’s not dissimilar to the data farms owned by the big players of the new digital economy, explains Marc Oshima, cofounder and marketing director of AeroFarms. “Like Apple, we own the hardware – that is the design and architecture of the farm and the software, which is, here, the algorithms behind growing the vegetables”, he explains. But these farming projects for the citizen of tomorrow are not constrained by immoderation: the possibility of production on your doorstep also encourages the start-up community to consider the planet’s biggest challenges. Ownfood, launched by Mickaël Gandecki, Nazaraly and Cassandra Francis, stood out at the recent COP21 meeting thanks to its “connected greenhouse” project. The idea? To allow an entire family to feed itself and become self-sufficient. Using an “open source” device, it relies on permaculture, aquaponics, an electronic automation system and a greenhouse to increase the amount of food produced throughout the year. Still at prototype stage, this “home-made” mini-farm takes the world of alternative farming to a human scale by opening it up to DIY enthusiasts.